Alfreton Town’s four game winning streak came to an end as an opportunistic goal from Rowan Liburd sealed a first away win for the Lions at the Reds expense. With Luke Shiels injured, Martin Riley started his first 90 minutes of the season, Curtis Bateson also came into the side with Callum Chettle moving to the bench. The Reds started the game well and an early chance for Bobby Johnson went begging as he headed over the bar from Bateson’s cross within the first minute. Guiseley remained camped in their own half, Tom Denton couldn’t adjust his feet quick enough in the box as he fired over the bar. With 11 minutes gone the Lions took the lead against the run of play, a under-hit back pass from Tom Platt caused problems for Riley at the back who saw the ball pinched off him by Liburd and the striker finished, slotting the ball into the empty net as Sam Ramsbottom attempted to intercept. Alfreton looked to hit back but Green denied Johnson in the box with a good stop with his legs, Green then punched a dangerous Bateson cross away and the Lions shot-stopper was called into action again, palming a Denton header over the bar. Ramsbottom saved well at the other end to hold onto a high looping header from Liburd as Guiseley countered. Bateson fired wide at the other end from a short free kick by James Clifton. The Reds kept getting caught on the counter and Ramsbottom again denied Thornton as the first half concluded. The second half presented more frustration for Billy Heath’s men, the tempo was far too slow and the Reds sloppy passing led to anxiety in the ranks. Guiseley were enjoying the possession and began to attack at will as the Reds grew more desperate. Ramsbottom saved well at the near post to deny a flowing move before Clifton was caught in possession to gift the visitors a corner which was eventually cleared. The Reds went down to ten men on 75 minutes after a harsh straight red card for Harry Middleton as he went in for a challenge. 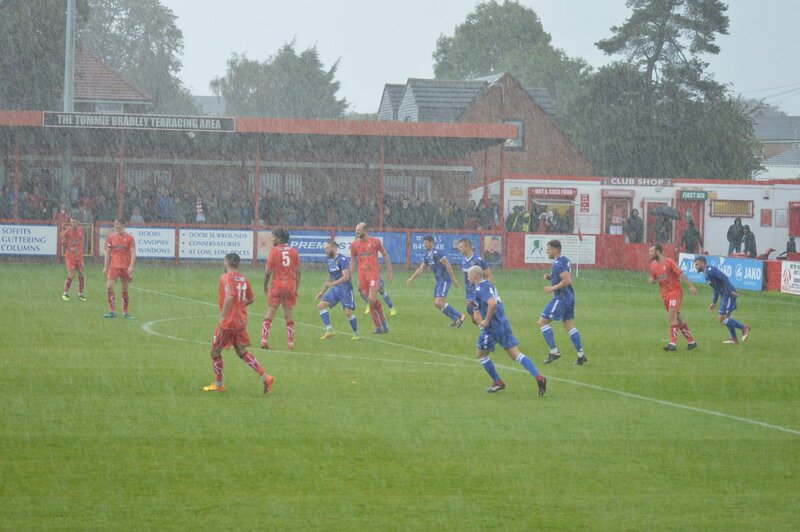 The sending off galvanised Alfreton for the final ten minutes, Heath’s side had been struggling to create meaningful openings especially in the second half. A late push in the final ten minutes saw Josh Gowling nearly get on the end of Johnson’s corner, Clifton’s free kick cleared away and Bateson’s low shot saved by Green. A frustrating outing for the Reds whose winning run ended but will look to bounce back straight away at league leaders Chorley on Saturday afternoon, 3pm kick off. ALFRETON: Ramsbottom, Clifton, Wilde, Platt (Middleton 55), Gowling, Riley(c), Johnson, Hotte (Bacon 73), Denton, Peniket, Bateson.